Crisp top notes of bergamot arouse the senses, while the aromatic essence of star anise imbues the top notes of the fragrance with a dynamic freshness. Floral heart notes of ylang-ylang are enhanced by the gentle caress of Mediterranean green almond. The base notes are announced by the Tolu balsam accord, while cedar wood nestles in the sensual delicacy of white musk and vanilla. Acqua di Parma Blu Mediterraneo Mandorlo di Sicilia Eau de Toilette Spray is rated 4.5 out of 5 by 6. Rated 5 out of 5 by GordyB from Another Winner from Acqua di Parma A close friend said she loved the smell of this, and I have to agree. The scent of almonds is fabulous, and does not fade quickly. 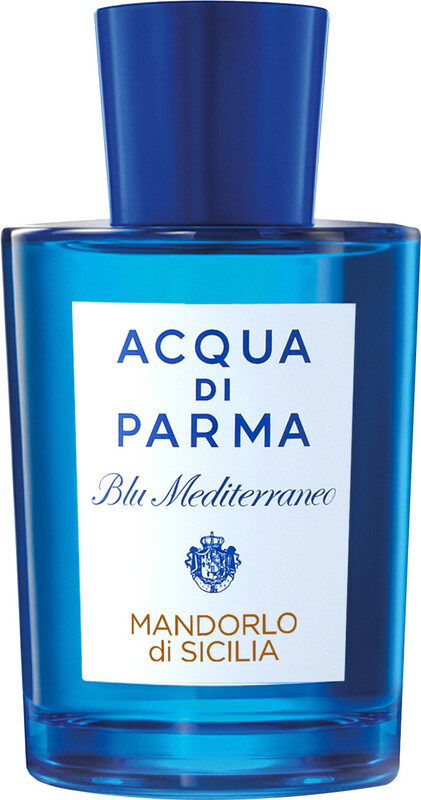 I'm a huge fan of Acqua di Parma, particularly their Blu Mediterraneo range. Rated 2 out of 5 by sazaid from Disappointing I was really looking forward to this product, and after a mix up with the delivery which eventually took 3 weeks, I was disappointed with the final product. It is very masculine which I didn't expect, as it didn't smell like this previously! It also doesn't last... really not happy with this product! Rated 5 out of 5 by ThePeninsula from Ethereal scent, lasts, perfect for summer. Have encountered this in shops, and intended to pick it up, but Escentual had the best price and quick delivery. Rated 5 out of 5 by TheMax from A keeper I recently acquired a sample of this cent with another purchase, after a shower in the evening I used 2 sprays at a distance to trial it. The vanilla was quite promenant and warm, lightly fresh but that was short lived, the almond, vanilla and musk stayed for the duration with the occasional jasmine/star anise appearance, still promenant in the morning. Longevity on my skin is 10 hrs + even an early shower didn't completely remove some tones. More than 2 sprays can be cloying as this is quite a deep, warm, sweet fragrance for cool evenings/cold days. Have this in my collection now, for an e.d.t it's quite the power house.